This is part of our series of stories from the National Community Reinvestment Coalition Conference in Washington DC from March 25-28, 2015. Learn more at www.ncrc.org. As part of the National Coalition Reinvestment Coalitions Annual Conference in Washington DC, Rob Breymaier of the Oak Park Regional Housing Center spoke about the strategies and policies used in his community to make Oak Park the destination place for diversity in Chicago’s suburbs. The lessons learned in Oak Park could give the attendees from around the county ideas and hope for creating more integrated, welcoming, and financially stable communities. The OPRHC was created in 1972, and currently has 7 full time and 5 part time employees plus volunteers. They work with housing professionals, including landlords, real estate agents, mortgage lenders, and developers to have consistency in visions best practices. They also sustain their work through housing referrals. 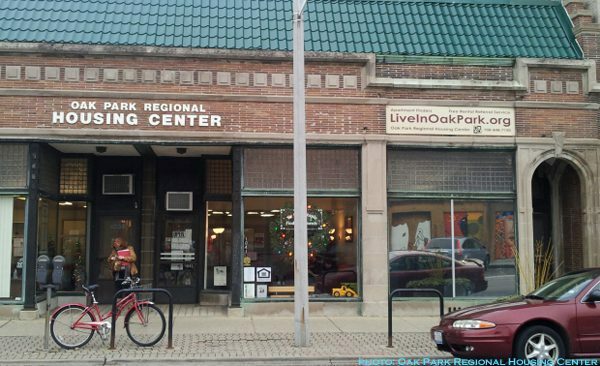 Oak Park is the first suburb west of Chicago, bordered mostly by segregated communities. The 4.5 square mile village has 52,000 people living in an area with historic buildings, plenty of public transit options and solidly middle class residents. And according to Breymaier two of the community’s greatest features are the fact that it was home to architect Frank Lloyd Wright and writer Ernest Hemingway, and thus has a vibrant artistic vibe, and secondly that it is intentionally diverse. In 1968 Oak Park passed a fair housing ordinance at the same time as Fair Housing Act. The Village Board members who passed that got death threats, and were told they were destroying the community. But the same people who had defended Julian’s right to live in Oak Park also stood strong in creating a welcoming environment for all people. One thing that was common in Chicago in the 60s and 70s was a phenomenon called “block busting.” This is where real estate agents would make big profits by scaring white home owners into selling their homes at below market value saying that black people would be moving in, and encouraging them to sell while they could. The real estate agents would then turn around and sell the homes at above market prices to black families, making them feel lucky to be moving into a white community. A chain reaction would follow as whites moved out and blacks moved in, with the real estate agents profiting heavily from the change. This practice had started happening in Oak Park, and that is why the OPRHC was formed – to prevent racially-charged shifts in the community and facilitate an integration process that was inclusive and positive. A key part of maintaining quality of life for all residents of Oak Park was actively working with people in the real estate, mortgage and banking professions to form relationships and let it be known the Oak Park would be a place that was fair to everyone. There are two ways to cultivate a just housing system, being reactive and being proactive. Oak Park’s proactive approach required, and continues to require, active engagement with everyone involved in housing, both in purchasing and in renting. Oak Park is about 40% rentals. A traditional, reactive, fair housing model tends to focus only on the benefits to the under-served community. Because interaction happens in terms of legal threats, it tends to create an adversarial and isolated movement instead of welcoming all stakeholders to the process. And it fails to get to the root causes of inequality by only treading the symptoms, Breymaier said. In the Oak Park model, his agency works with home buyers and renters in their search, rather than waiting until after they have faced discrimination. They seek to engage everyone involved by explaining the benefits of integration. They bring everyone together to “build and aspirational and inclusive movement.” And they address the structures and systems of equal opportunity to promote lasting change. “Enforcement only does not include everybody,” Breymaier said. “White people feel like there is nothing for them. They can get sued. Why should they have conversations? Breymaier contended that enforcement, while obviously an important tool, is not particularly effective in creating long term change in housing. The OPHRC works directly with landlords and real estate agents. They work with elected officials and developers to ensure quality building design and unit features. They promote effective and fair management techniques, including doing trainings on how to fairly screen renters and by encouraging resident managers in rental properties. They keep the value of fair housing and diversity in their discussions on a regular basis. 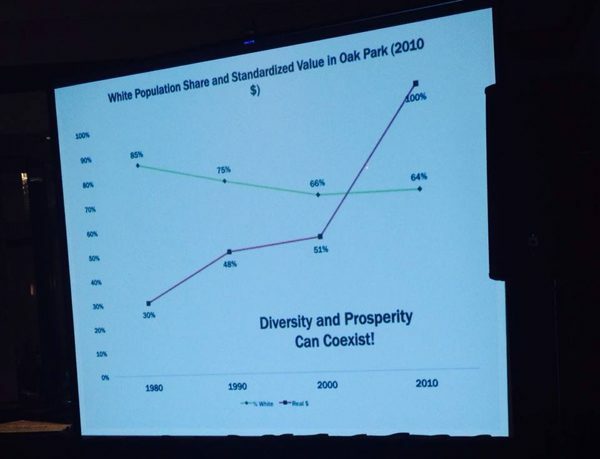 The key to the success of their efforts is using data to make sure Oak Park is representative of the region as a whole, and to show that a rise in diversity equals a rise in prosperity. In fact, the data showed that Oak Park weathered the housing market crash because their tight-knit, community-building-minded realtors and lenders did not engage in predatory lending practices like people in other areas did. There is a concern that the rise in home values might price out minority residents, but thus far Oak Park has remained on target with reaching their ideal mix of residents. For the Chicago area, it’s a middle of the road place in terms of rent and upper middle for home purchasing. And, Breymaier noted, there are people in every race of all income levels. “We don’t have to conflate race and income. We stick with race, not income. When someone walks down the street you don’t peg them about their class based on their skin color. There are rich and poor people in every community,” he said. 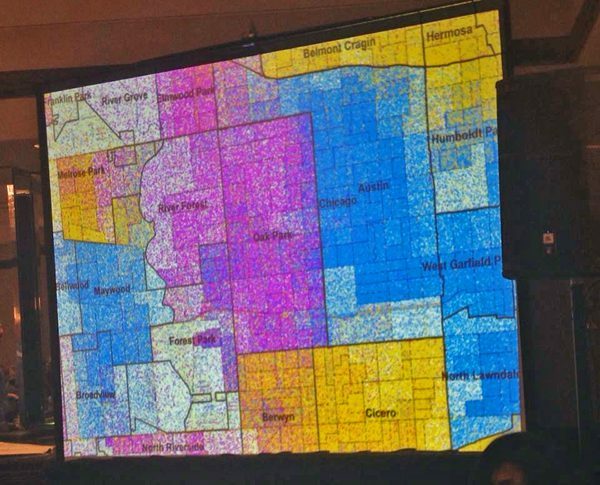 There is still some division in the community, with a slightly higher concentration of people of color on the east side of town. The OPHC helps potential renters see the value in looking beyond racial makeup in making their housing choice. They take potential renters to diverse areas of the community and introduce them to neighbors, show them amenities, and answer any questions they may have. They also work with the village and with developers to make sure that amenities, like playgrounds and streets, are the same or better on the eastside to encourage more people to want to move there. The OPRHC is a nonprofit whose main function is to connect renters with available housing. Landlords can list for free and are asked to make donations if the program is successful for them. This model gives them resources to continue their work while also supporting their mission of fair housing and integration. Using awareness and promotion of diversity has helped Oak Park become the most integrated suburb of Chicago and helped it rise to a solidly desirable place to live for all types of people. Breymaier hopes other communities will learn from the proactive approach to integration. To learn more about the OPRHC visit their website at http://www.liveinoakpark.com/about-us.